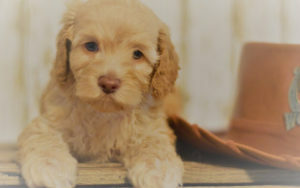 Australian Labradoodle breeder Honey Bear made her debut into the family when Matilda and Charlie whelped their Old West Litter. Her eyes and muzzle were lovely from the beginning, and by the time she was old enough to be adopted, we knew we could not let her go. We were too in love. We changed her name to Honey because of her beautiful color and her sweet demeanor. When we shared this with the guardian family, we learned that the youngest of the daughters once had the nickname “Honey Bear,” and it was settled! Honey Bear she is. Honey Bear has a tall and slender build like her father. However, she has a soft and almost fleece-like coat that is practically straight. She is extremely soft to the touch. Her creamy coat is accented by her darker ears and muzzle, giving her an angelic appearance. Honey is a sweet companion. She wants to be in the presence of her humans. She has tender eyes that can also give her away when she has been a little naughty. She loves to hide her toys and bones. She truly is a content and happy girl… the happiest girl in the world according to her guardian family, and we agree. She is quiet and gets along with all of her human and animal friends. At night, she tucks herself under the covers and lies with her head on a pillow. Honey throws calm, well built, and beautiful litters. Her puppies have been red, apricot, and white. Her grown pups range in weight from 11 to 28 pounds. She follows in the footsteps of her mother, Swinging Gate Matilda, by being a loving and devoted mother.